The foundation of Northern Trust's responsible investment principles is that we act in a manner to protect our clients’ financial well-being. 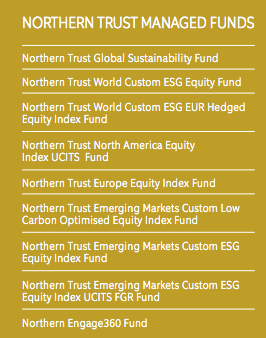 Northern Trust offers investment capabilities with sustainable objectives in equity, fixed income and real assets. The approach and objective of a sustainable investing strategy is multi-dimensional, and may apply differently to different asset classes. While sustainability factors may be broad in nature, we focus on certain key issues and approaches in our investment framework. Our comprehensive Sustainable Investing Philosophy encompasses responsible investing factors such as our bespoke ESG pooled fund policies, our engagement policy for our European index funds, corporate governance and internal engagement principles and our custom proxy voting policy with ESG guidelines. Northern Trust believes that, by serving as an active owner on behalf of shareholders, we will help portfolio companies produce sustainable value, and that companies' long- term financial returns are connected to their strategic, environmental, social and governance performance. Sustainable investing is based on the philosophy that ESG analytics can complement quantitative or fundamental investment techniques to mitigate risks or capture new opportunities. Our definition of sustainable investing is based on the acknowledgement that the long-term financial success of our clients and shareholders is dependent upon a healthy global environment, a stable society and well-functioning/well-governed companies. We view the integration of environmental, social and governance factors as being part of our fiduciary heritage with a long-term focus.